On 25 and 26 May, incessant heavy rainfall brought by the southwest monsoon triggered flooding and landslides in 15 of the 25 districts of Sri Lanka. 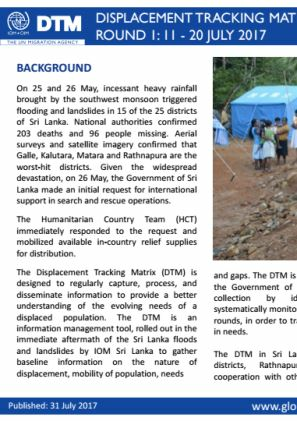 The information from the 2nd round of DTM is expected to be useful for the government and other humanitarian actors, particularly to understand the recent condition of displacement in Rathnapura District. 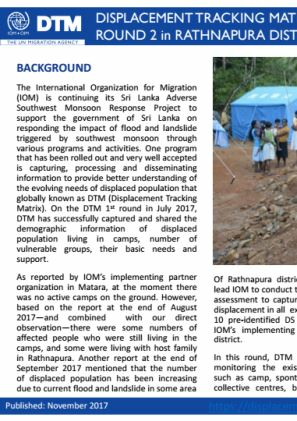 DTM identified 545, 283 affected individuals and 80,409 individuals in safe sites. 361 safe sites were identified. 768 houses were fully damaged and 5,869 houses were partially damaged. 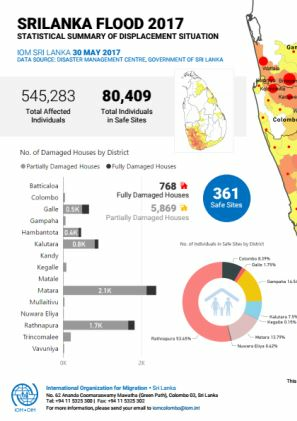 Most damaged houses were identified in Matara.